Chateau des Fines Roches Vignobles Mousset Barrot is owned by the Mousset Family that also own Jas de Bressy and Domaine des Saumades, as well as Mas Grange Blanche. 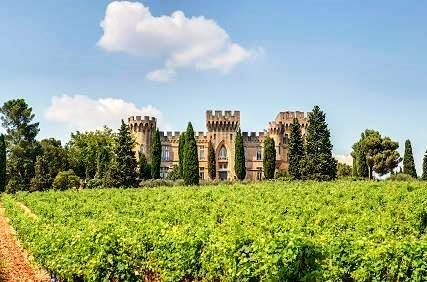 More than just a winery, Chateau des Fines Roches is a beautiful hotel in the Chateauneuf du Pape appellation that is clearly a landmark, with its picturesque motif. The modern castle was built in the late 1800’s. The Mousset family purchased the Southern Rhone Valley estate in 1936 from Societe des Grands Vins de Lyon. Prior to 1976, the production was mostly sold to and through their negociant business. Today, the company, formally known as Vignobles Mousset-Barrot are striving to improve the wine of Chateau des Fines Roches. Chateau des Fines Roches owns 53 hectares in the Chateauneuf du Pape appellation. 48 hectares are planted to red wine varieties. 5 hectares are reserved for Chateauneuf du Pape Blanc. They also own 74 hectares of vines in the Cotes du Rhone appellation. Chateau des Fines Roches produces 2 red Chateauneuf du Pape wines and 1 white Chateauneuf du Pape wine. Chateau des Fines Roches Cuvee des Fines Roches is produced from about 34% Grenache, 33% Syrah and 33% Mourvedre. The vines are on average 90 years of age. The terroir is rocks, stone and clay soils. The vines are planted in the la Grenade vineyard. The wine is aged in 505 demi-muid and the other 50% is aged in 100% new, French oak barrels for 12 months. On average, the production is close to 17,500 cases per year. Chateau des Fines Roches is produced from a blend of 70% Grenache, 15% Syrah and various other allowable grape varieties. The Grenache is at least 40 years of age. The vineyard has a terroir of rocks, and clay soils. The vines are planted in the Cansaud, Fargueiron, la Grenade and la Petite Bastide lieux-dits. The wine is aged in a combination of used, French oak barrels and demi-muids for 12 months. The production is close to 500 cases per year. Chateau des Fines Roches Chateauneuf du Pape Blanc is made from 50% Grenache Blanc, 20% Bourboulenc, 20% Clairette and 10% Roussanne. The wine is then aged for 6 months in tank before bottling. Close to 1,750 cases are produced each year. Chateau des Fines Roches can be enjoyed on the young side. Young vintages can be popped and poured, or decanted for about 1 hour, give or take. This allows the wine to soften and open its perfume. Older vintages might need very little decanting, just enough to remove the sediment. Chateau des Fines Roches is usually better with 2-4 years of bottle age. Of course that can vary slightly, depending on the vintage. In the best vintages the wine should be consumed within 3-12 years after the vintage. Chateau des Fines Roches is best served at 15.5 degrees Celsius, 60 degrees Fahrenheit. The cool, almost cellar temperature gives the wine more freshness and lift. Chateau des Fines Roches is best served with all types of classic meat dishes, veal, pork, beef, lamb, duck, game, roast chicken, roasted, braised, stewed dishes, sausage, barbecue and cassoulet. Chateau des Fines Roches is also good with Asian dishes, hearty fish courses like tuna, mushrooms pasta, eggplant, cheese and tomatoes. The white wine of Chateau des Fines Roches is best served with a myriad of different seafood dishes, shellfish, crab, lobster, sushi, sashimi, chicken, pork and veal, as well as Asian cuisine. Medium bodied, soft, refined, silky red fruits, cracked pepper and kirsch are all over the place. Forward in style, the wine has sweetness and ripe tannins that makes for early drinking pleasure. The wine was produced from 34% Mourvedre, 33% Grenache and 33% Syrah. Medium bodied, elegant, soft and refined, the wine is fresh, soft and sweet, with a nice, juicy, kirsch note on the backend that will be perfect for early drinking pleasure. The wine was produced from 70% Grenache, 15% Syrah, 8% Mourvedre, 5% Cinsault and equal parts of Cinsault and Muscardin. More complex and richer than the traditional wine, her you find plums, dark cherries, spice and licorice. Soft and supple, the wine ends with spicy black raspberries. The wine was produced from equal parts of 34% Grenache, 33% Syrah and 33% Mourvedre. Medium bodied, light in color and fruit, the wine is forward, soft textured and shows fresh, sweet, spicy red fruits in an open personality that will be perfect for early drinking pleasure. Medium bodied, soft, forward, already approachable, with a core of black raspberries and herbs made for early drinking pleasure. Light in style, this red berry, floral charmer will be best enjoyed in its youth. Medium bodied, easy drinking, open styled wine with fresh kirsch on the nose and palate. Medium bodied with red fruits and spice, the wine is already open, ending with a soft, kirsch finish. Spicy, medium bodied, easy going and dominated by red fruits, this is already drinking well. Ash, tobacco, burnt leaves, smoke and earth scents, along with hints of red fruit in the perfume was the best part of the wine. The short finish offered some spice and kirsch. Still, it was an honor to taste a Chateauneuf du Pape made when while World War 2 was still waging.